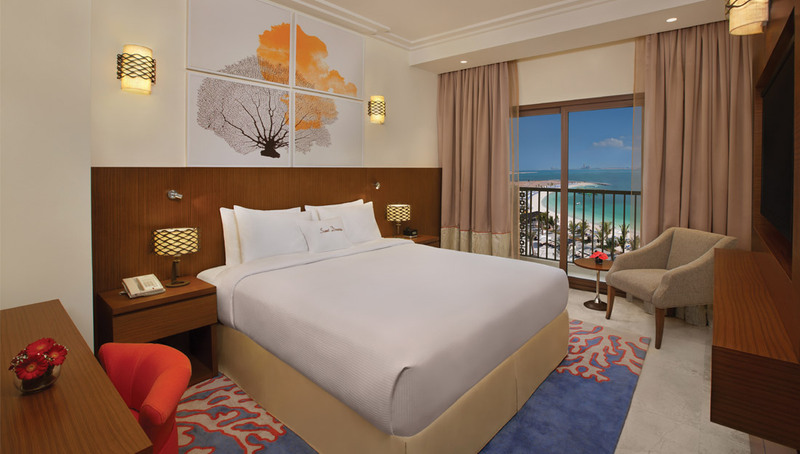 The family-friendly Double Tree by Hilton Resort and Spa on Marjan Island is a tranquil oasis in an adventure-filled destination. Relax on the golden beach, take a dip in one of seven temperature-controlled pools or indulge in a cocktail at the rooftop bar. Children can enjoy limitless play at the Pirate Boat Aqua Zone with super-fun water slides, and a whole host of fun activities at the kids’ club. Modern and contemporary accommodation features magnificent views of the azure Arabian Sea from the balcony or patio. The lavish 'Bay Club' rooms are set within beautiful beachside villas and offer a wealth of extra benefits and privileged services. Located in an area of stunning natural beauty, combined with authentic experiences and history, you’re sure to have an unforgettable holiday in Ras Al Khaimah. The resort is set around a stunning bay, with 450m of silky-soft white sandy beach to enjoy during your holiday. This spectacular resort has an exclusive location on Marjan Island and boasts numerous restaurants and bars, a spa and an abundance of fantastic facilities. 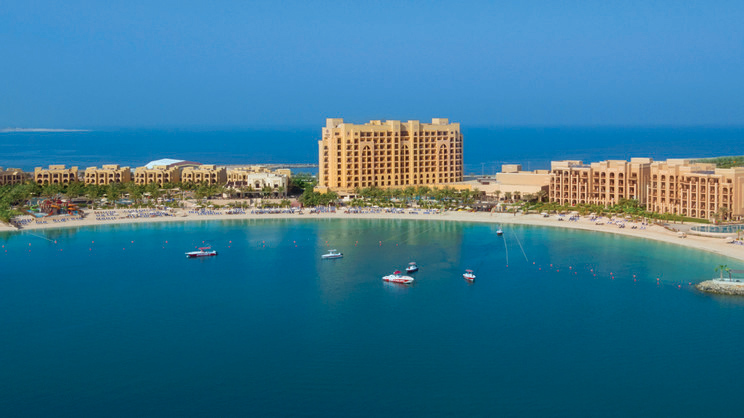 It’s an idyllic haven of relaxation in peaceful Ras al Khaimah. If you fancy getting out and about in the area, the centre of Al Hamra is approximately 5.4km away. Here you’ll find the fabulous Al Hamra mall, a championship standard golf course, and a cinema. Alternatively, you can treat the family to an authentic desert life experience at the Bedouin Oasis Camp within 45km. Dubai International Airport is approximately 75km away from Double Tree by Hilton Resort and Spa Marjan Island. A range of comforts and conveniences combine to provide guests with a luxurious DoubleTree experience. Some of these rooms boast a magnificent sea view to enjoy from the comfort of your balcony. 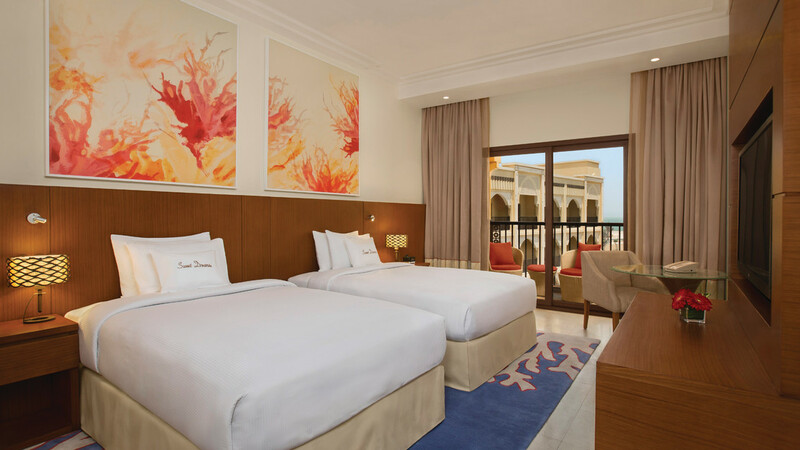 This spacious room features a king-size bed and a generous private balcony. 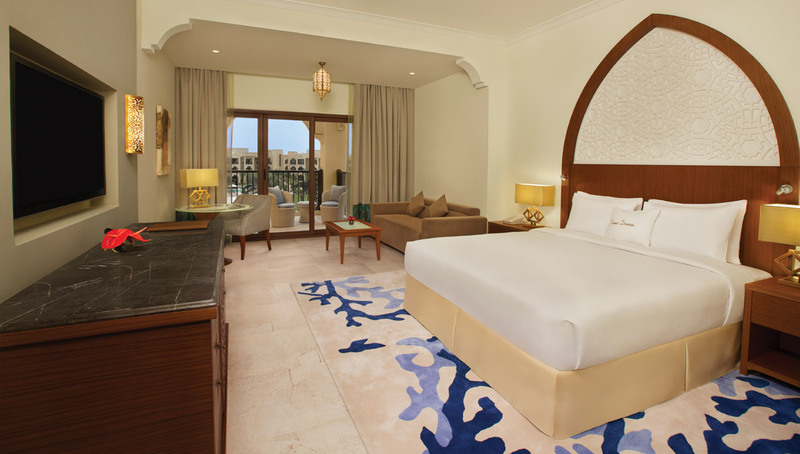 Located in the villa building, these bright and spacious rooms overlook either the garden or the glistening Arabian Sea. Relax in this stylish room, with a private furnished balcony and plush king-size bed. 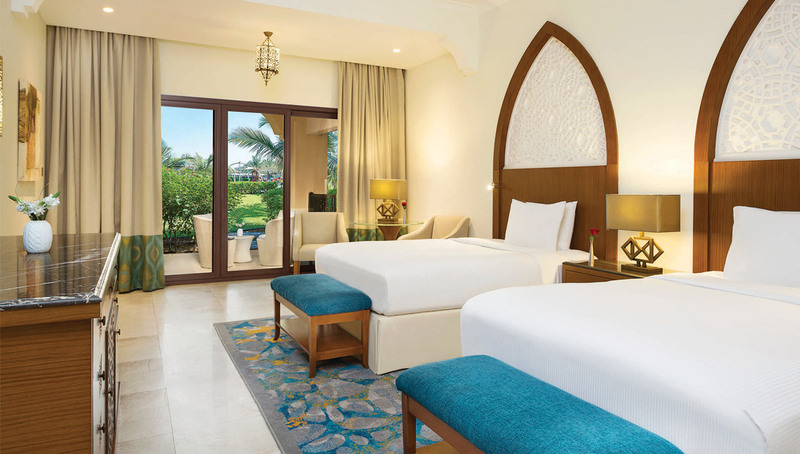 These deluxe rooms overlook either the manicured garden, or the Arabian Gulf. 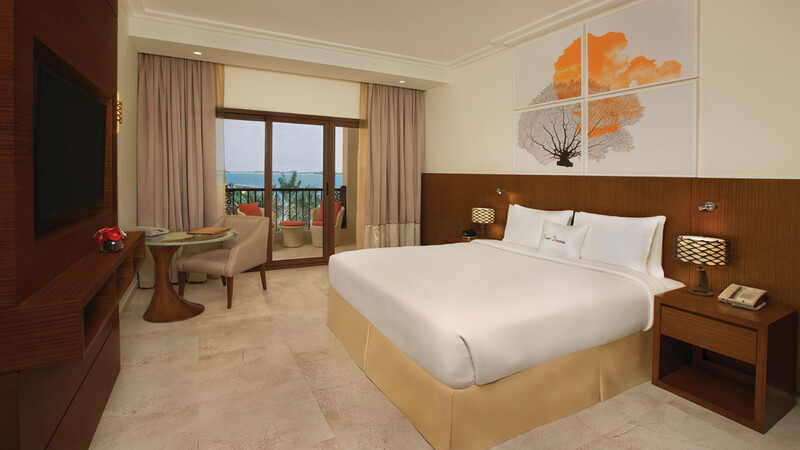 Enjoy exclusive access to all the privileges of The Bay Club with a stay in one of these stunning beachfront rooms. Some rooms have direct beach access, and all have magnificent sea views. Relax in the luxurious setting of a one-bedroom suite filled with luxury amenities and special touches. There's a spacious lounge area and balcony with views of the Arabian Gulf. Lavishly styled with neutral tones and elegant furnishings that create contemporary feel, these suites feature and array of luxury amenities. The spacious living area leads onto a balcony with stunning sea views. Family friendly and boasting a charming décor, Vespa is the setting for delicious Italian cuisine. Enjoy a wide variety of classics and specials posted via the daily specials board. Light snacks and beverages, fresh coffee and sweet delights, The Lobby Lounge is a great place for socialising and to simply sit and relax. This is a stylish gastro-pub where extensive beer and wine lists go hand in hand with British-style traditions and maritime inspirations. Live sporting events are televised on the big screen plus darts and pool are the typical pub games. Innovative European delights and home-style cuisine served in a delightful Brasserie setting with a fantastic range of beers, wines and coffees. Delicious healthy snacks and juices are the order of the day at Boardwalk, a beautiful poolside addition. As the sun goes down, the theme turns to stylish evening dining under an Arabian sky. Enjoy a great range of world cuisine in this fabulous all-day dining venue. Live cooking stations and a contemporary setting all add to the modern take on a buffet restaurant. Embark on an intoxicating voyage through the colours and tastes of Turkey and Lebanon with authentic dishes at Meze Restaurant. Offering a large terrace with views of the Arabian Gulf, Sanchaya warmly invites you to sample the finest Asian cuisine in ambient surroundings. If you choose to go all inclusive, the programme generally consists of breakfast, lunch and dinner, all buffet style, served in the main restaurant. Please note that laundry, internet, minibar, room service, phone calls and spa treatments are not included in your package. An exciting addition to the already majestic Doubletree by Hilton Resort & Spa is The Bay Club. 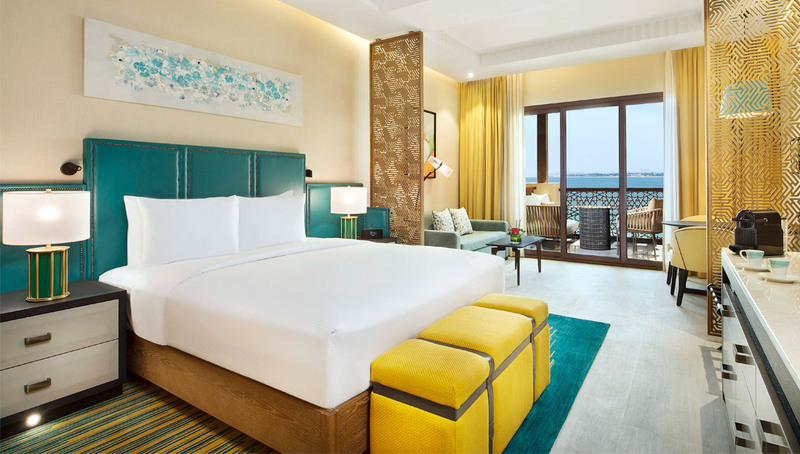 Set within stunning beachfront villas, the lavish Bay Club Rooms overlook the relaxing Arabian Sea with stunning views from each terrace or balcony. Rooms feature special touches and can be accessed via a separate check-in area from the main resort. There’s access to a private infinity pool, with indulgent Jacuzzi exclusively for Bay Club guests and a dedicated beach area. You’ll also find thoughtful privileges such as a Ladies Only Spa, relaxation lounge and café, Wi-Fi in public areas and a shopping arcade with branded products. After a day of indulgence and luxury, retreat to the Bay Club Restaurant or any of the two private à la carte restaurants before heading on to the XclusiV Boutique Night Club.